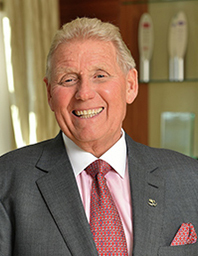 Tony Pidgley is Chairman of the Berkeley Group plc. He left school at 15 to form his own company in haulage and plant hire. At 19, he sold his business to Crest Homes and became a Building Director reporting to their Managing Director, Jim Farrer. In 1975, Tony and Jim left to form Berkeley Homes. The company enjoyed considerable growth over the following 10 years. Tony has gained a national reputation for his pioneering approach to building homes and creating successful places. His judgement of the markets, willingness to put his personal capital at risk, and his drive and commercial flair have made Berkeley one of Britain's best residential developers. Berkeley now has a reputation for outstanding commercial performance and the ability to create beautiful homes in sustainable places. Berkeley was voted Britain's Most Admired Company in 2011 across all sectors and was ranked the UK's most sustainable major housebuilder for eight years in a row. In 2014, the Berkeley Group won the Queen's Award for Sustainable Development for the second time. Tony Pidgley is now part of Lord Heseltine's Estate Regeneration Advisory Panel and the Thames Estuary 2050 Growth Commission. His expertise has been used to advise the Mayor on the Outer London Commission and the Government on the disposal of public sector land. He is also a trustee of Open City London, a charity that champions architecture education, and President of the London Chamber of Commerce and Industry. In 2016, he was nominated New Londoner of the Year in recognition of his contribution to housebuilding across the capital.